Cardi B has been announced as the final headliner for this year's Longitude festival and despite it only being January, our bodies are severely ready for cans in hot weather, luke warm naggins, and wandering around Marlay Park for approximately three days. The rapper was confirmed as the festival's latest headliner today. She'll be joining ASAP Rocky and Chance The Rapper on the main stage across the July weekend, beginning on Friday 5 and finishing up on Sunday 7. Cardi B will headline on the Sunday, with ASAP Rocky performing on Friday and Chance on the Saturday. Also announced for the festival today were Anne-Marie, Vince Staples, Gunna, Trippie Redd, H.E.R, Flatbush Zombies, AJ Tracey, JPEGMAFIA, J.I.D, Jimothy, and Joey Purp. Longitude tickets will be back on sale on Friday, February 1 at 9am. Prices start at €79.50 for a day ticket and €199.50 for a three-day weekend ticket. 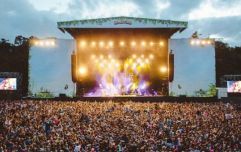 Win 2 tickets to Longitude for an all-round epic weekend!